Dot.com Vroom > Most young sport compact tuners have big dreams. Twenty-year-old Igor Sushko is finished dreaming. The first time Igor Sushko drove a car on a track—any track—was two years ago. He was 18 years old. It was raining. He tightened the 350Z’s rear antiroll bar to its maximum setting, took out the spare tire, shut off the traction control and spun out on his second lap at Mid-Ohio. This month, he debuts a Nissan Skyline GT-R in the SCCA Speed World Challenge GT series. Seriously. There have been plenty of 20-year-old rookie racers, but few have done it the way Sushko has. He didn’t work through karts or race Formula Fords in England. Sushko hasn’t raced in any national series. He’s gone to a handful of racing schools, but most of his experience has come from lapping at track days. His biggest accomplishment so far: Winning three races at a Skip Barber Formula Dodge regional event. Compare that with Team Cadillac’s lineup: Andy Pilgrim, Max Angelelli, Ron Fellows and Johnny O’Connell. They combine for more than 100 years of racing experience, including the 24 Hours of Le Mans, NASCAR Nextel Cup and Rolex Series. How does a young guy with almost no race experience get in this premier GT series? Why, the Internet, of course. Sushko is the CEO of AutomotiveForums.com, a forum for car enthusiasts with more than 440,000 members. He started it when he was 14 and living in Lexington, Kentucky. “There weren’t a lot of extreme cars around, and I just wanted some kind of network community for car enthusiasts.” By the time Sushko had his learner’s permit, the site had pulled in enough money from ads to afford him a deposit on the 350Z. 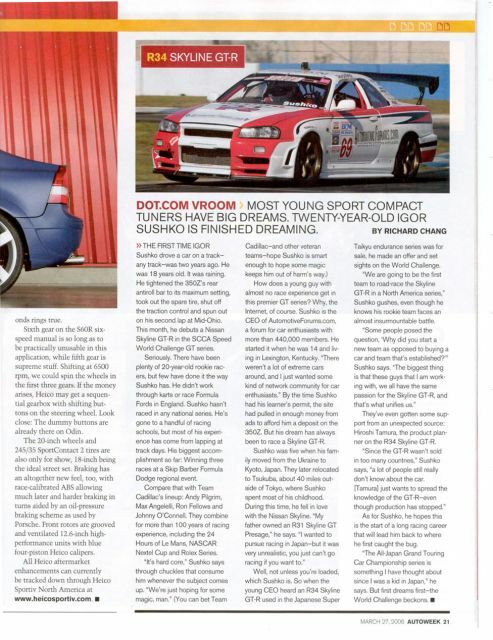 But his dream has always been to race a Skyline GT-R.
Well, not unless you’re loaded, which Sushko is. So when the young CEO heard an R34 Skyline GT-R used in the Japanese Super Taikyu endurance series was for sale, he made an offer and set sights on the World Challenge. “We are going to be the first team to road-race the Skyline GT-R in a North America series,” Sushko gushes, even though he knows his rookie team faces an almost insurmountable battle. They’ve even gotten some support from an unexpected source: Hiroshi Tamura, the product planner on the R34 Skyline GT-R.
As for Sushko, he hopes this is the start of a long racing career that will lead him back to where he first caught the bug. “The All-Japan Grand Touring Car Championship series is something I have thought about since I was a kid in Japan,” he says. But first dreams first—the World Challenge beckons.